Pelham Art Center is thrilled to announce the continuation of our Public Art Program, In the Courtyard, with a new sculpture by New York City based artist Andréa Stanislav. Wonderwall will be on view in our 2,300sq.ft open courtyard from July 1 – September 18, 2014 with an opening reception on July 11, 2014 from 6:30-8pm. 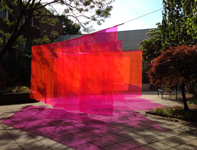 Wonderwall (Fluorescent Fuchsia Labyrinth) is an ever changing experiential and interactive sonic installation that responds to the architecture of the Pelham Art Center’s courtyard space, exterior light, and visitors. The sculpture is made from transparent fluorescent vinyl, steel tubing and steel rope. Participants experience a minimalist transparent construction of “walls” that reference a labyrinth form and is activated by its glowing florescent fuchsia color and light. The sonic element is remixed by noted NYC musicians Kevin Tooley and Dean Lozow. The source of the remix is from Wonderwall Music — the soundtrack to the 1968 by English musician George Harrison’s film Wonderwall, and debut solo album. The film is about a wall that occasions a transformative experience for those who are able to look through it. The title of the installation is also in reference to the Britpop band Oasis, who were influenced by The Beatles, and the Wonderwall film with their hit “Wonderwall” in the 1990s. The florescent viny and sonic element work off each other towards moments of harmony through sound, light and movement. The installation aims to strike a balance and synergy between a physical form, light, color and sound for the visitor/participant. Andréa Stanislav (b. 1968, Chicago) is an American artist, based in New York City, whose practice includes sculpture, video installation and public projects. Ms. Stanislav received a MFA from Alfred University, New York; and a BFA from The School of the Art Institute of Chicago. Her work considers themes of harmony and deconstruction in the natural world, popular culture and, by extension, regards the sublime — realized through unexpected visual manifestations, multi media installations and monumental sculpture. Selected solo exhibitions and projects include: 21c Contemporary Art Museum, Louisville, KY; Bemis Center for Contemporary Art, Omaha, NE; Minneapolis Institute of Arts, Minneapolis, MN; Redux Contemporary Art Center, Charleston, SC; and The Cynthia Corbett Gallery, London, UK. Ms. Stanislav has recently received a 2014 Art-centre Pushkinskaya-10 St. Petersburg International Residency Award, 2013 Imagine Fund Award, The Lower Manhattan Cultural Council – Swing Space Artist Residency, New York, NY, among many other awards. Public and private art commissions and project locations include: Weisman Art Museum, Minneapolis, MN; New York, NY; University of Oregon, Eugene, OR; Morningside College, Sioux City, IA; Mon Serrat, Spain; Key West, FL; Louisville, KY, and Washington DC. Andréa Stanislav’s work is represented by The Cynthia Corbett Gallery, London, UK; Packer Schopf Gallery, Chicago, IL; and Jonathan Shorr New York, NY. She is an Associate Professor of Visual Arts at the University of Minnesota – Minneapolis, where she is the head of the Sculpture Area. The Pelham Art Center Gallery Advisory Committee seeks site specific proposals for our Public Art Program In the Courtyard, which considers the scale, architecture and use of the courtyard. Proposals are accepted on the basis of creativity, interactivity, structural integrity and sustainability. Please visit our website at http://www.pelhamartcenter.org/in_the_gallery/educators.cfm for more information on how to apply. A group exhibition highlighting recent work by PAC’s faculty and students. * Please note that Virginia Scotchie’s installation in the courtyard has been cancelled. These events and programs are made possible, in part, by the ArtsWestchester with funds from Westchester County Government. Pelham Art Center also receives funding from: New York State Council on the Arts, A State Agency; Westchester Jewish Community Services; hibu; Nurses Network of America; Town of Pelham; New Rochelle Campership Fund; Bistro Rollin; Robin’s Art+Giving; Nycon; Junior League of Pelham, Prospect Hill Lunchtime Enrichment; Strypemonde Foundation; Mark Link Insurance; Broadway Electric, Owen Berkowitz; Members; and Annual Fund Donors. This entry was posted in Press Releases and tagged pelham, public art, sculpture, westchester. Bookmark the permalink.